Biking in Ridgewood is about to to get city-sanctioned! Pull up a map of bike routes along the Brooklyn-Queens border and you will find that there's an absence of city-designated paths for cyclists north of the one down Central Avenue in our neighborhood. If you are a seasoned NYC cyclist who has had a brush or two with death on city streets or a fan of the band Total Slacker, whose drummer Terence Connor was killed in a hit-and-run while riding his bike on Metropolitan Avenue last October, we are sure that you would welcome the addition of a few safe routes. It seems like our neighbors in the county of Queens are on the same page: Stephen Miller at Streetsblog NYC reports that Queens Community Board 5 announced at a transportation committee meeting last Tuesday evening that they're partnering with the Department of City Planning and the Department of Transportation to add at least six and possibly as many as ten new bike lanes to Ridgewood: As early as fall of 2014, there may be some must-ride routes to check out your way to Bunker or Ridgewood Market! 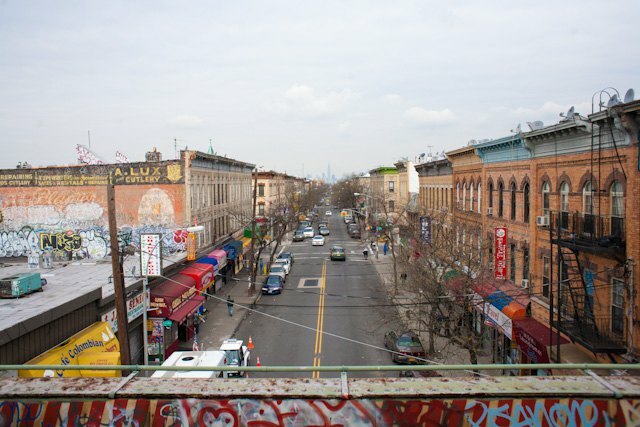 The routes that Bushwick-dwellers will likely be most excited for are a path from Metropolitan avenue to Cypress Hills Cemetery that will run along Woodward Avenue and Onderdonk Avenue, and an as of-yet undesignated possible route directly between Ridgewood and Bushwick. Miller says that the other paths are: "Eliot Avenue from Metropolitan Avenue to Woodhaven Boulevard; Juniper Boulevard South from 69th Street to Dry Harbor Road.... Central Avenue and Cooper Avenue from Cypress Hills Street to Woodhaven Boulevard; 69th Street from Calamus Avenue to Metropolitan Avenue; and 80th Street from the Long Island Expressway to Myrtle Avenue. There are four additional routes that could receive further study: Grand Avenue, a north-south route between Ridgewood and Maspeth, a route between Ridgewood and Bushwick, and a loop around Juniper Valley Park. CB 5 transportation committee member John Maier said DCP was also considering a route along Rust Street, connecting to streets near Woodside." The bike lane plans are announced on the heels of similar projects in Sunnyside and Long Island City, and will be implemented in conjunction with plans for a pedestrian plaza that will be maintained by the Myrtle Avenue Business Improvement District; in an earlier article in the Queens Ledger, Andrew Shilling reports that the project was precipitated by efforts by the Ridgewood Property Owners and Civic Association. Do live in or near Ridgewood and want a say in the Bike Lane process? CB5 meets on the second Wednesday of every month at 7:30pm, and their next meeting will be on September 11th, at 61-23 Myrtle Avenue in Glendale. Additionally, the Department of City Planning will be co-hosting a workshop with with Community Board sometime this month to present their recommendations about the project; stay tuned for that date. In the meantime, don't leave your helmet home when biking up north!